Intense colours, a beautiful light fragrance, romantic symbolism, born in the Mediterranean region and blessed with a divine name: there are many sides to the carnation. It's high time to discover them all! 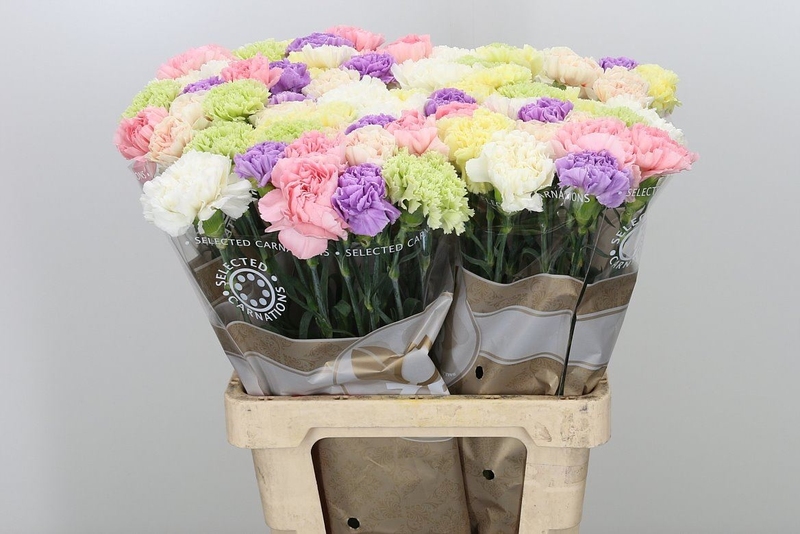 Green, deep purple, dark red, fluorescent yellow, champagne, soft orange, salmon pink, white or a combination of colours: the carnation offers a magnificent array of colour. But that is certainly not the only remarkable thing about this flower. For example, are you familiar with the various shapes? There are carnations with single flowers and spray carnations. And the carnation also has eye-catching petals, with rounded, serrated or fringed edges. So it's no surprise that the carnation is a fantastic lead performer or support act in any vase. The carnations symbolises passion, longing and romance. That's why Renaissance painters in the 15th and 16th century chose this flower to appear in their engagement scenes. And nothing has changed in that regard: the carnation is still an appropriate gift for demonstrating ardent love. Or to revive the passion in your relationship - if that should be necessary…The different Carnations have their own meaning. The red Carnation symbolizes passion, admiration and longing for someone, pink Carnation represents love of women and also means "I will not forget you." the white Carnation is a symbol of devotion and dignity. The original birthplace of the carnation is on the coast of the Mediterranean region. The popularity of the flower goes back many centuries; the Romans were already making wreathes and fresh eau de toilette out of carnations. The flower can also be regularly seen in religious paintings, as a symbol of the Virgin Mary and as a symbol for the suffering of Christ. The Latin name for the carnation is Dianthus, derived from Dios (God) and anthos (flower). That means that the carnation is a divine flower! The carnation offers many surprising possibilities when it comes to styling. Choose carnations with the same shape and hue and place them in a terracotta pot or jug. This creates a stark, basic look. Or combine carnations in various colours and shapes in a weathered metal vase to make a rugged statement! The carnation combines well with tulips, roses, ranunculus, fritillaria and chaenomeles. Buy loose flowers and create a bouquet in your own style. Use green grasses and fine herbaceous materials such as eucalyptus; the fantastic effect will surprise you! Of course you could always ask your florist to put together a nice bouquet for you.